America is a nation that takes beer seriously. So it's probably not a coincidence that in 1898, the same year Hawaii was annexed by the United States, the Honolulu Brewing and Malting Company was established in Honolulu. All they needed was a professional place to make suds. In 1899, a New York architect -- his name now unknown -- designed a steel-frame concrete building to house the brewery. The concrete walls were 18 inches thick, more than sufficient to hold up a four-story structure, but a decorative casing of red brick gives the building a sense of delicacy and fragility. The grand facade facing Queen Street is almost pure decoration, with sweeping three-story brick arches, corbels and patterns demanding the finest masonry skills to assemble. It's a wonder the Masons didn't make it their headquarters when the brewery shut down in 1960. The materials were shipped in from San Francisco and the site was the original home of Primo Beer. It's now under the care of the Hawaii Community Development Authority. Despite a $28 million renovation a decade ago (which included bracketing the historic structure with senior housing), the building is still largely empty thanks to a pervasive stink created by a wood-sealing product called PermaClear 65. Last month, after years of attempted remedies, the state sued the contractors who performed the work. Maybe they should sit down and have a beer or three together. Address: 553 South Queen St. 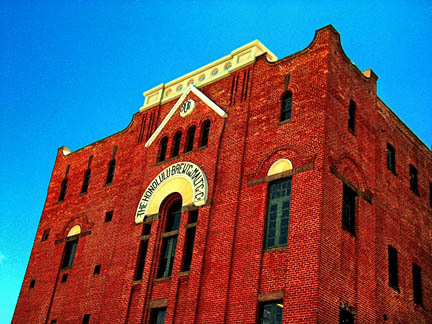 The Royal Brewery stands as a testament to the skill of turn-of-the-century masons, but more recent renovations went awry. Every Sunday in the Star-Bulletin Travel section, rediscover the charms of old Hawaii through a tour created by the Honolulu Historic Trail Committee and Historic Hawai'i Foundation and supported by the city's Office of Economic Development. The yearlong project commemorates Honolulu's bicentennial. See Holoholo Honolulu for past articles.